Are you having problems with your FAP/DPF? FAP/DPF or Anti-Pollution warning lights on your dash? Facing expensive repair costs to replace the FAP/DPF? From February 2014 the inspection of the exhaust system carried out during the MoT test will include a check for the presence of a FAP/DPF. A missing FAP/DPF, where one was fitted when the vehicle was built, will result in an MoT failure. A vehicle might still pass the MoT visible smoke emissions test, which is primarily intended to identify vehicles that are in a very poor state of repair, whilst emitting illegal and harmful levels of fine exhaust particulate. It is an offence under the Road vehicles (Construction and Use) Regulations (Regulation 61a(3))1 to use a vehicle which has been modified in such a way that it no longer complies with the air pollutant emissions standards it was designed to meet. Removal of a FAP/DPF will almost invariably contravene these requirements, making the vehicle illegal for road use. The potential penalties for failing to comply are fines of up to £1,000 for a car or £2,500 for a light goods vehicle. A FAP/DPF (Diesel Particulate Filter) also known as FAP on some French vehicles, is a device fitted to the exhaust system of modern diesel vehicles to reduce emissions and meet European emission standards. It does this by trapping Soot (Particulate Matter - PM) from the exhaust gasses while letting the gasses flow through the system. As with any type of filter a Particulate Filter needs to be cleaned regularly to function properly. 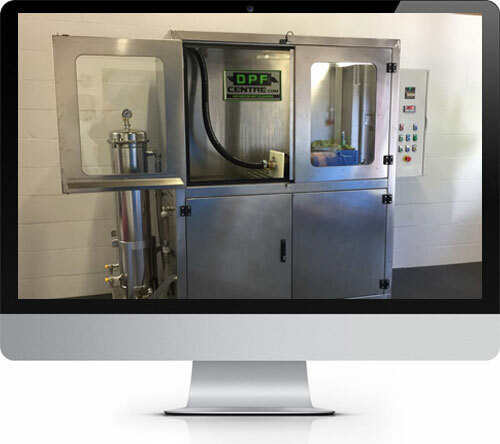 With FAP/DPF’s this is done by a process known as Regeneration which involves a combination of a Catalyst function in the system and burning the soot to gas at a very high temperature leaving behind an Ash residue within the FAP/DPF. Regeneration should be an automatic process taking place in the normal use of your vehicle, you may have noticed this in the form of a blast of white smoke form the exhaust on occasions. FAP/DPFs have been in common use in passenger cars and light commercials from around 2003 in preparation for Euro 4 regs (2005), with Peugeot, Renault and BMW being early takers. Euro 5 (2009) made it compulsory for diesel cars and light commercials to have a FAP/DPF fitted and Euro 6 2014 will tighten this up further. If regeneration doesn’t function properly it leads to a build-up of soot affecting performance and fuel economy, left unattended this will result in a Blocked FAP/DPF which can ultimately cause very expensive damage to other engine components. A blocked FAP/DPF is also potentially dangerous as it can cause overheating in the exhaust system and cause a fire risk. To prevent this damage most new vehicles will go into “Limp Home” safety mode at this stage, meaning the vehicle will have minimum power barely sufficient to crawl home. Even if the regeneration functions as it should, over time the Ash Residue will build up in the FAP/DPF and have the same affect ultimately resulting in a blocked FAP/DPF. For this reason a FAP/DPF is classified as a Serviceable Item by the vehicle manufacturers like brake pads or air filters etc and not covered under warranty. FAP/DPF systems therefore need to be maintained properly. If your FAP/DPF warning light or Anti-Pollution warning is on, please do not ignore it (typical dash warning symbols below). Get professional advice, consider your options carefully and attend to the problem. Leaving it will ultimately cost you much more in additional repair bills and it can be dangerous. FAP Replacement – Quantum dealers can replace the FAP/DPF, normally at a fraction of the main dealer cost. FAP Recalibration – If you have had your FAP/DPF core removed, your Quantum dealer may be able to recalibrate your vehicles ECU to stop your engine going into limp-home mode and clear the FAP/DPF warning light. Consumers must be aware of the legal implications (as above) of this being carried out. FAP removal is legal in certain countries and when used for off-road or motorsport – if in any doubt please take advice. It is often said that you should “go for a blast” down the motorway to clear the FAP/DPF. Please note this is only partially true. If the FAP/DPF is blocked beyond the capacity for regeneration or blocked due to Ash residue, you will do more harm to your engine. There are many FAP/DPF cleaning additives available promising a magic cure for FAP/DPF. We have yet to find one that will clear a blocked filter and will certainly not clear an Ash blocked filter. Some products can however be useful in keeping a functional FAP/DPF in good health. FAP/DPF units are closely linked with other emissions components, if these parts do not function properly they can help to block the FAP/DPF, similarly a blocked FAP/DPF can damage these components due to excess back pressure. FAP/DPF units are located close to the Turbo, if the turbo is leaking oil it can help to block the FAP/DPF, similarly a blocked FAP/DPF can damage the turbo due to excess back pressure. Some PSA engines fitted to Peugeot, Renault, Ford, Volvo and Nissan have an on board Fuel Additive System connected to the FAP/DPF to help regeneration. It is important to maintain this system and keep it topped up with the additive (only available from main dealers approx £130 per tank) if not it will block the FAP/DPF. In our experience this is often neglected, even by main dealers due to the cost. If you have the FAP/DPF removed this function as it is no longer required and can be disabled. Some vehicles have a dedicated FAP/DPF or Emissions or Anti-Pollution warning light which is great, however many will just have an Engine light on. It is important to check by diagnostics why the light is on and not advisable to simply get the light turned off without investigation. FAP/DPF work is complex and should only be carried out by experienced professionals with the correct specialist equipment. All work on a FAP/DPF has to be completed with the appropriate recalibration or reset on the vehicle ECU. It is not possible to simply delete the FAP/DPF electronically or just remove the FAP/DPF unit without work on the ECU. It is our experience that many garages including main dealers are not knowledgeable in FAP/DPF and related issues. Our dealers often see customers after they have spent a lot of money on the wrong fixes as the FAP/DPF fault was not correctly diagnosed. Diesel Particulate Filters were designed with good intent to reduce particulate emissions and offer a better environment. In theory a FAP/DPF would trap soot in urban areas and then regenerate on the open road, unfortunately this does not always work well leading to expensive repairs. The fact that FAP/DPF units are made with expensive minerals like Platinum, that excess fuel is needed for the regeneration process and that ultimately the accumulated soot and ash has to go somewhere… back into the environment which many now question the overall environmental value of the entire life cycle.